“We are in a bond market bubble that’s beginning to unwind.” This is the statement of Alan Greenspan. Is he right? 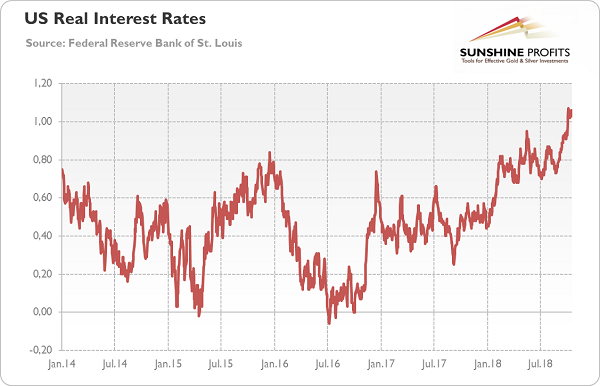 We invite you to read today’s article about the US bond market and find out whether it is in bubble or not – and what does it all mean for the precious metals market. For some analysts, such high levels are not sustainable. However, when you adopt a broader perspective, you will see that the bond yields are not extremely high. As the chart below shows, their current levels are still historically low. 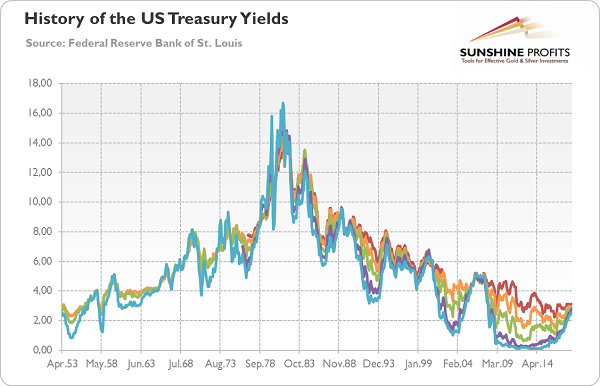 The bond yields used to be much higher in the past – and not only in the 1970s, when inflation raised its ugly head, but even in the early years after the Great Recession. Actually, many analysts claim the opposite, arguing that bonds prices, which move inversely to yields, are too high. For example, Bill Gross, a famous bond investor, believes that the bear market in bond prices has just begun. Similarly, Alan Greenspan, the former Fed Chair has recently said that “we are in a bond market bubble that’s beginning to unwind”. And, at least this is an impression after reading an excerpt from the upcoming book by Paul Volcker, it seems that he would agree with Greenspan. What is important here is the reason behind the recent moves. The yields increased because traders caught up with the FOMC projections for the federal funds rate next year. We have been warning investors for a long time that the divergence between traders’ bets and the Fed’s view would not last forever. About two months ago, traders were pricing just slightly more than one hike in 2019, even though the Fed forecasted three rate increases. Now, the market sees more than two hikes. Importantly, the breakout in long-term yields made the yield curve steepen. The spread between 10-year and 2-year yields climbed above 30 basis points, rebounding to the level before the September slide, as one can see in the chart below. It’s quite funny as practically all analysts were forecasting the imminent inversion. We were skeptical about that popular narrative (see, for example, this article) and it turned out that we were right. The only problem is that we have heard about the imminent sell-off for years. But the 10-year yields have recently spiked above 3 percent – and nothing happened. The reason for that is that the increase in yields is likely to occur not in a single, explosive upward move, but gradually over an extended period of time. Moreover, higher yield should spur renewed demand for bonds (if they generate higher income, they might look more attractive), moderating the impact of any sell-off. The bottom line is that we could see even higher bond yields in the future. The Fed’s tightening of monetary policy combined with widening fiscal deficits should exert an upward pressure on rates. 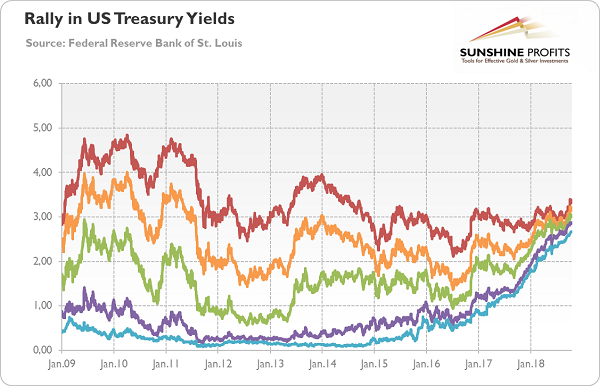 However, as the US central bank moves relatively slowly, the increase in yields is likely to also be gradual. The higher demand for bonds, in particular from foreign investors (just see what is happening in Italy or in certain emerging markets), should moderate the pressure on bond prices. 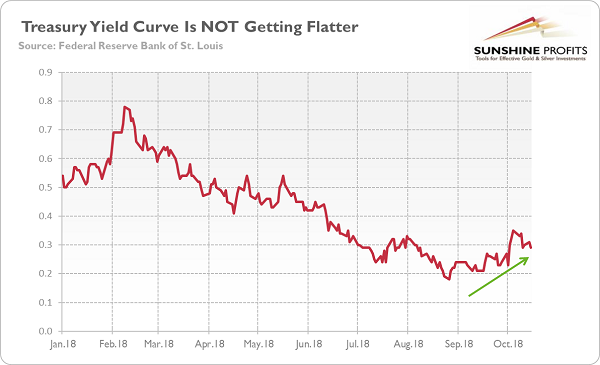 The gradual rise in yields should not demolish the gold market, but it will not help the yellow metal either. The problem is that nominal yields have been rising not due to inflation, but because of the increase in real interest rates, as one can see in the chart below. If you start having NEGATIVE interest then the Treasury Notes are certainly overvalued. I would lock up all my paper money for 10 years then I will be ahead of the person holding a Treasury Note with Negative interest (which means “Give me $101 now and after 10 years I will give you back $100”). Once they talk about Negative interest rate, you know that either the nation has “mass insanity” or there will be rampant robberies. Yes, but these days, it’s even worse. In the US, the nominal interest rate never went below zero, but after inflation (rising prices), the real rate of interest was negative. Then, to top it off, we had to pay taxes on the nominal income, even though the purchasing power was falling. And, in such a scenario, if you put your money ‘under the mattress’ you fared worse, since you had the inflation but not even the nominal interest. 3. even with negative interests. Keeping gold is no better as the government can still tax you on “capital gain” caused by inflation! The only way to avoid it is to move all your assets oversea! This is the way of multi-national companies. We can’t blame them.